Hi!!! I hope everyone’s started their countdown to Christmas because the 15 days are sure to fly by. Shanghai’s isn’t really known for it’s Christmas spirit, but the decorations and music are already coming up. For students, the tail end of December means FINALS WEEK. Sure, exams are stressful, but it also means a 90% drop in actual schoolwork. Less schoolwork= more time= more eats! As everybody probably knows, I’m a HUGE sucker for roast meat/fish. I’m also a diehard fan of Japanese cuisine. The Japanese beat me to the punch about 200 years ago and came up with Yakitori, those ubiquitous skewers offered at Japanese restaurants. 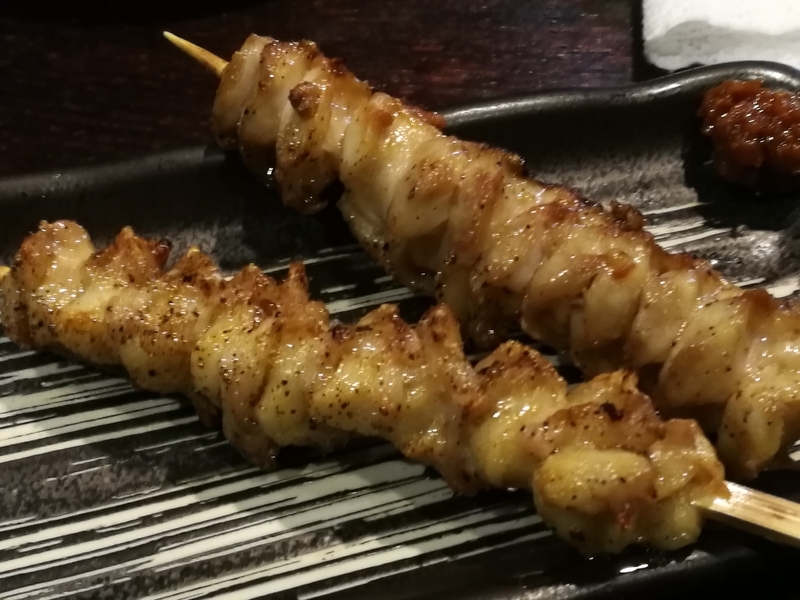 Yakitori, or “grilled chicken” in Japanese, is traditionally cooked over a charcoal grill to impart a deliciously smoky and slightly charred flavour. 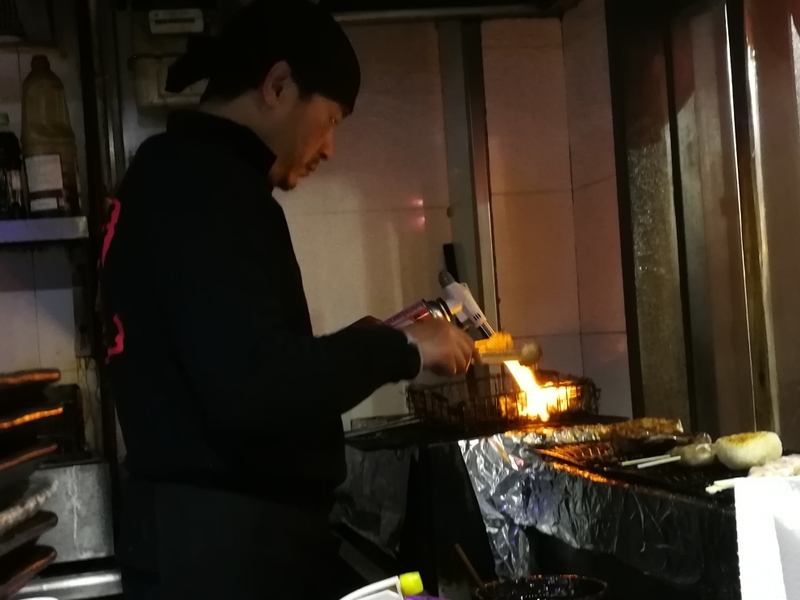 Unfortunately, due to either laziness, fire safety laws or a combination of both, most restaurants outside of Japan resort to the fryer, leading to greasy skewers lacking depth. Then, I discovered Toriyasu. 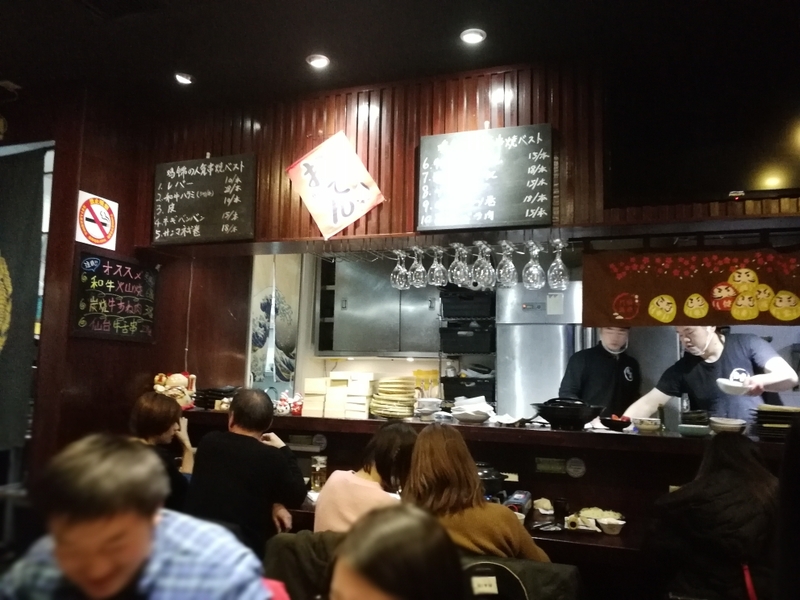 Torikin is the type of small hole in the wall gem I cannot resist going to. 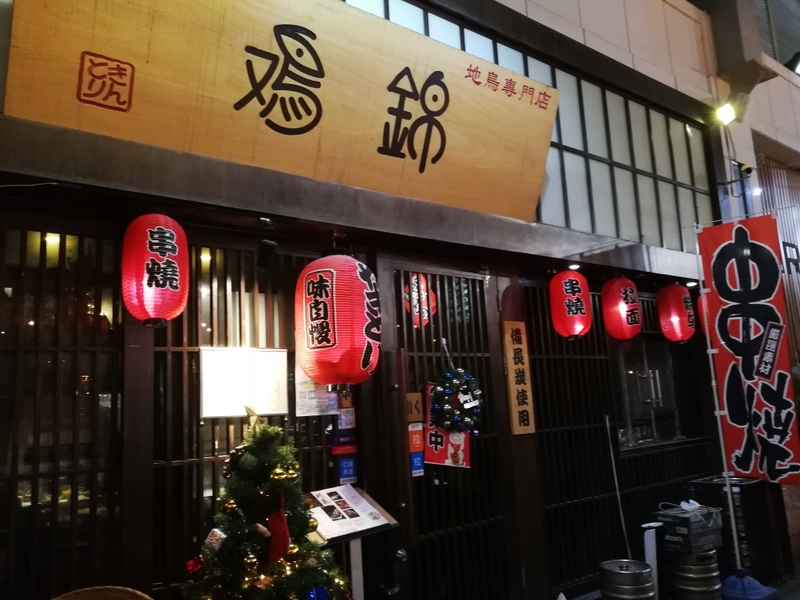 It’s also known as Shanghai’s best yakitori joint. The trick is to find it. 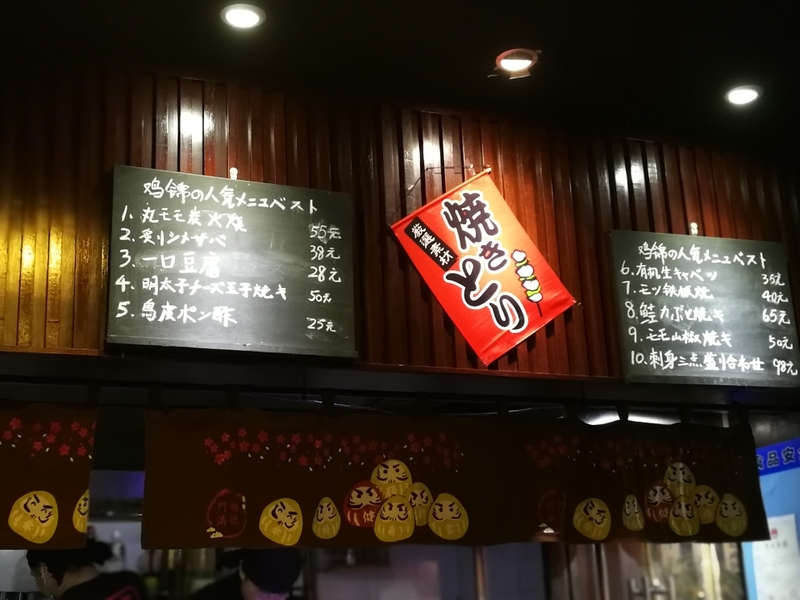 The original joint was at 2876 Yan’an West Rd, a true hole in the wall. We did eventually get there; I was pretty hungry; Time to eat! 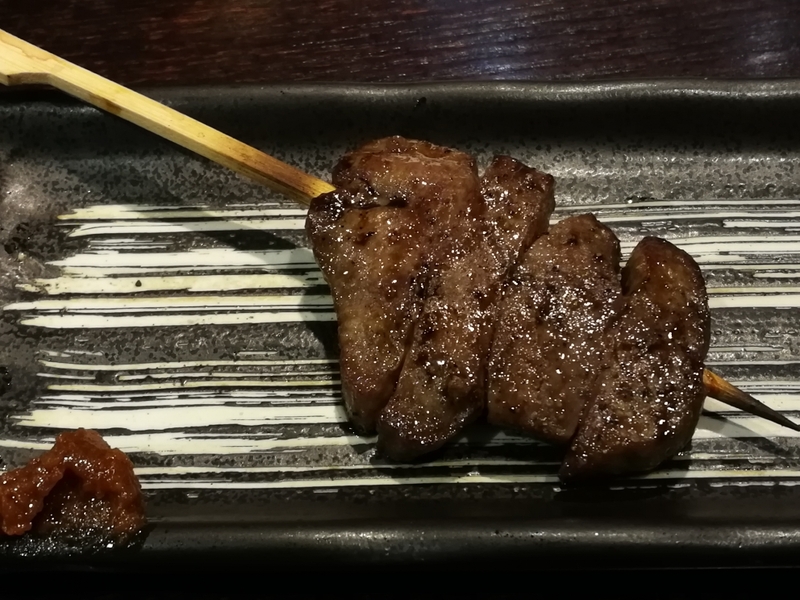 Chicken Liver- Liver is probably one of the last things most people would order on a yakatori menu. Although I love liver, I would agree. Undercook the liver and it becomes a bloody, nausea inducing mess. Overcook by mere seconds and it develops a sickening powdery texture. 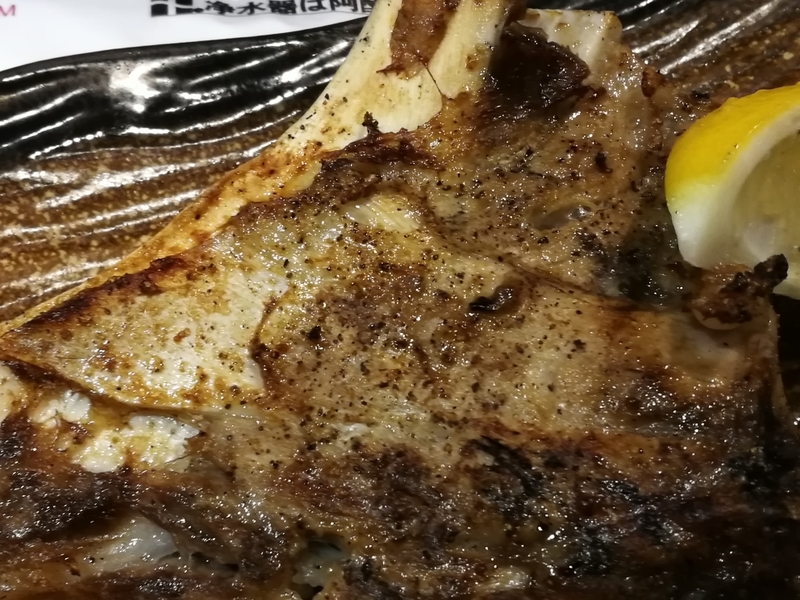 However, at Torikin, liver is ranked number ,1 for good reason. The liver itself was incredibly fresh, which did wonders to minimize the offputting aftertaste often associated with liver. The smoke and expert seasoning further enhanced the natural, rich, irony flavor. Most importantly, the cook was impeccable. Note: give this a try, but remember, the smoke and spice enhance flavor, not remove it. If you don’t like the actual taste of liver, you won’t like this. Crispy Chicken Skin- Liver can be controversial, but few would dispute the merits of perfectly crispy chicken skin. Thus it’s no surprise this dish ranked #3. Torikin managed to take an already great dish to another level. First, they accordian the skin to prevent it from drying out. This keeps it crispy without a grainy texture. 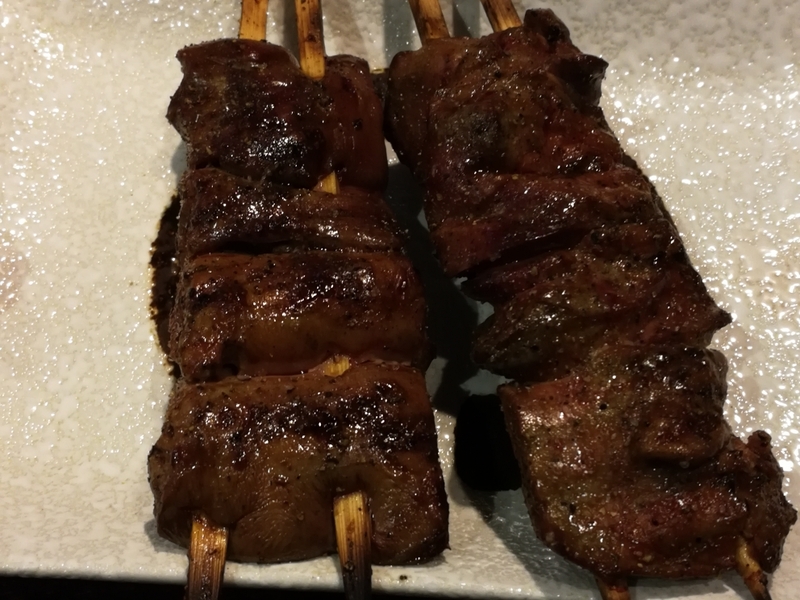 They also manage to keep the skin thick without making the skewers oil slicks. AMAZING! Salmon Cheek (salmon head on the menu)- This dish isn’t technically yakitori, but I can’t resist salmon head. It didn’t even realize it made top ten. When the dish arrived, I realized “salmon head” was a mistranslation. What we got was three thick, meaty pieces of salmon cheek. I could not have been more impressed. Besides being incredibly fresh, the fish had a perfect fat ratio. The cook turned out to be better than the meat. Not only was the skin perfectly crispy, the meat was JUICY, like a steak! The spices and smokiness also magnified the beautiful natural richness of the salmon. Even my dad, who hates fish, raved about this dish. ORDER THIS!!!! Beef Tongue- This dish, like chicken skin, is another deceptively simple delicacy on the top 10. 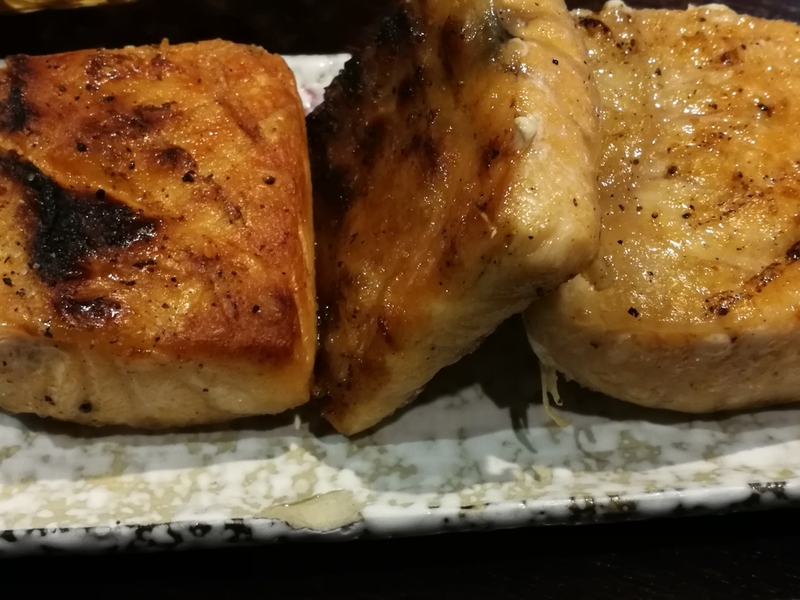 Although tongue provides a great, beefy flavour at nearly all cooks, Torikin managed to find a sweet spot between medium rare and medium that allowed just enough blood to cut the natural fattiness of the meat. I think it’s repetitive to mention the magic of smoke and seasoning at this point. 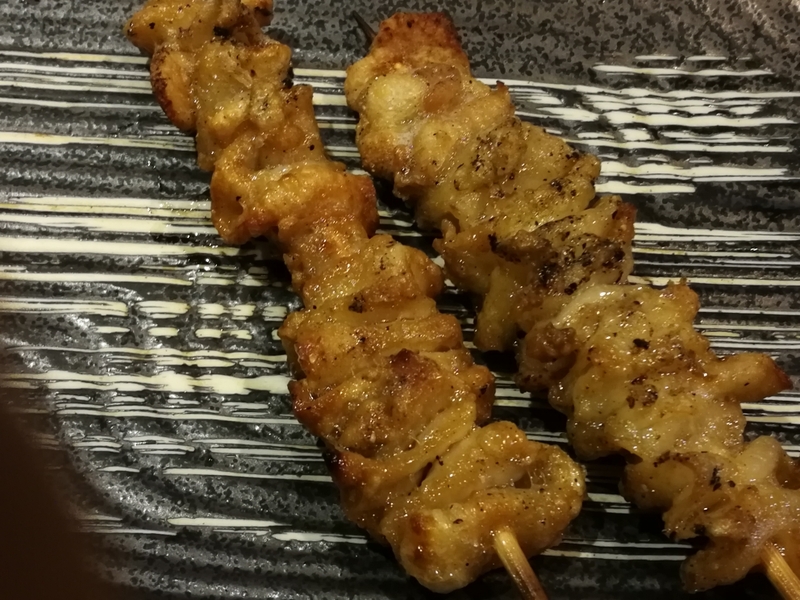 Chicken Cartilidge- Although this sounds strange, it’s actually one of the most popular yakitori items. By the time this dish arrived, my expectations were through the roof, and it certainly didn’t disappoint. The key to great cartilidge is crunch and juice without greasiness. Check and Check. To elevate the flavor, add light seasoning and charcoal smoke. Check. To make it top ten, trim each piece to get the perfect balance. Yes, I watched the chef work each piece and literally crouch down to the table before skewering it. That’s the precision and dedication at this restaurant. Tuna jaw- I saved the best for last. This dish isn’t on the top 10, but it deserves to be number 1 by my standards. Personally, I think the problem isn’t the taste, but the size. The thing is MASSIVE. There’s literally a good 6-8 oz of pure meat under that perfectly crispy, deliciously fatty skin. Speaking of the meat, it was jucier than the salmon. I would say the service and atmosphere were the highlight, but the food was too good. Its vibe is a combination of a small post work hangout and an intimate family joint. The rush of the wait staff and excited conversations created a lively and friendly but not overwhelming atmosphere. This is probably one of the best restaurants I’ve ever been to. I’ll definitely find any excuse to go back. 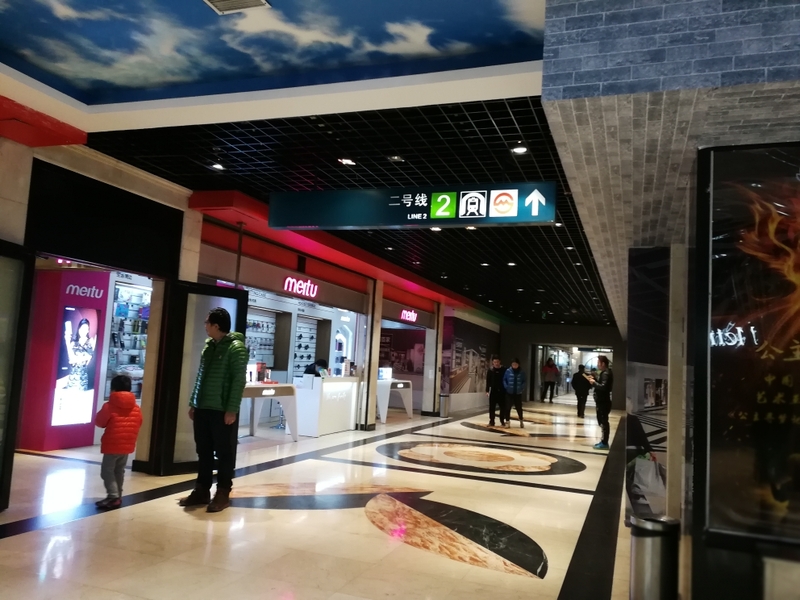 If any of you ever come to Shanghai, remember Hongqiao airport has a line 2 metro and Pudong Airport also makes connections. Well, that’s it for this week. I hope everyone has a great week and until we meet again- Happy Holidays! Awesome! I want to go too!